I think you will always need some kind of a base with it. The glitters are tiny. What if you layered it over red and did the anchors in black? Love this! I really like the nautical theme! 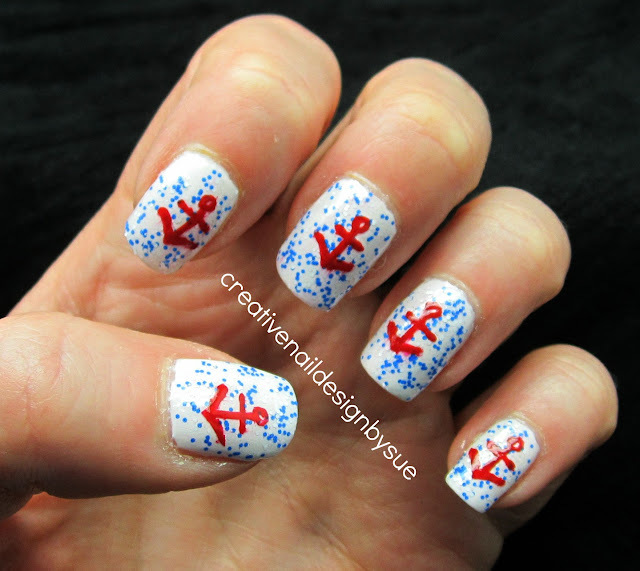 Love the blue glitter and the anchor stamp. You have bought some cool indie polishes. Super cool! Agreed that it's a pity that the white glitters doesnt show though.. I bet it would look gorgeous over a deep navy blue base! the white and blue glitters would really pop! ooo or even over a red base!!!!! now I want this polish! That's such a pretty color! Love the anchors! It really ties it all together. yay red white and blue! btw, i'm having a $50 gift card giveaway!